The whole procedure takes only one click. 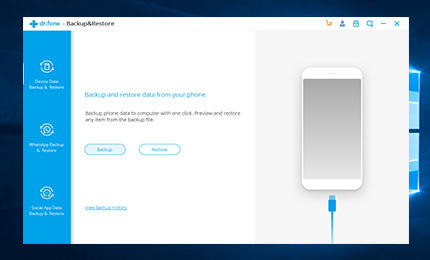 Once the iOS device is connected to the PC, the program will automatically backup all types of data on the device. What's greater about this program is that the new backup file will not overwrite the old one in case of losing important data. Moreover, you can either keep all data or delete any of them as you wish. Backup and restore iOS data with one click after connecting your device. You can make iOS backup everyday and all the backup files are saved and won't be replaced by new ones. You can preview details of all your iOS backup files with this iOS backup and restore program. After the preview, you can choose any item in your iOS backup to restore it to your iPhone or iPad. It won't replace any data existing on your device. If you want to read or print your data, you can also export items in your iOS backup and saved as an HTML file or others as you like. There is no data lost during backup, restore or export. And the program only reads data without changing or harming it. It takes only a few clicks to complete the process.